Turkey wants to be the mediator between the new Obama administration and Iran, using its growing role in the Middle East to bridge the divide between East and West, said Turkey’s prime minister, Recep Tayyip Erdogan. Mr. Erdogan said in an interview on Sunday that Barack Obama’s election opened new opportunities for a shift in relations between the United States and Iran, Turkey’s neighbor. Mr. Obama said during his campaign that he would consider holding talks with Iran, something the Bush administration has long opposed. The United Nations has placed sanctions on Iran for a nuclear program that the United States and other nations say is working to develop a nuclear bomb. Iran says the program is peaceful. Turkey supports the position of its Western allies but argues that the sanctions are weakening Iranian reformists. Turkey fears an economically and politically isolated Iran, which supplies it with its principal alternative to Russian energy. It also wants to avoid another military conflict on its borders. 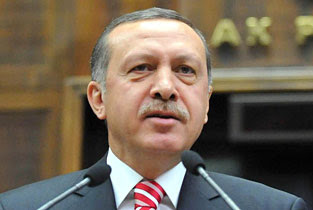 Turkey has its own nuclear ambitions and is undergoing efforts similar to those in Iran. Further, Turkey is in the middle of important energy developments occuring between the EU and Iran, in which the latter might well supply the former with large amounts of natural gas via pipelines laid across Turkish soil. Any positive role Turkey can play in allaying the tension between Iran and the Untied States is certainly to the benefit of Turkey as well. Ahmadinejad visited Turkey in August. After its founding in the 1920s, Turkey cut off relations with its Muslim neighbors, even changing its alphabet from Arabic to Latin. Let us see now. The Muslim neighbours would be, France (Syria), England (Iraq) and Iran (under Reza Shah) and the USSR (Nakhcivan). Reza Shah did visit Turkey and did try to emulate Ataturk -- not exactly the 'Muslim' thing being pushed now. It appears that the NYT is trying to parrot the idea that the new republic was deliberately cut-off from the former Ottoman lands and Muslims in general, but is doing it so clumsily that it ends up being ridiculous. Neighboring countries now account for 30 percent of Turkey’s foreign trade, up from 8 percent before Mr. Erdogan’s party was elected, said Ahmet Davutoglu, Mr. Erdogan’s top foreign policy adviser. In another excellent example of high quality reporting, no mention is made of the effect of the lifting of the trade sanctions against Iraq, and the role of increasingly expensive natural gas imports via pipelines. So one's led to believe that there's some Muslim thing at work there and furthermore that it is solely this government's magic. It can also be noted that at the founding of the Turkish Republic, Turkish foreign relations existed in the context of a completely transformed Middle East. As most of Turkey's neighbors were largely under the auspices of European imperialism, it can be argued that Turkish foreign policy was as much defined by a desire to set its own path--something other countries in the region were not in the position to do. Most significantly, forging relations with former non-Turkish Ottoman provinces was not a priority. Oh, of course, yes. It can also be argued that any such attempt would have been perceived as setting on a path of 'dangerous' irredentism by the West and therefore were deliberately avoided to get some chance to recuperate w/o provoking the great powers. There are also many conspiracy theories about this (and about the abolishment of the Caliphate and thus losing the influence over the Muslims under British rule beyond the former Ottoman territories).